I'm Mad and I Eat: Nuts: Ho, Ho, Ho! Nuts, yeah. I like 'em. I like a snack of roasted, seasoned nuts, usually walnuts or almonds. And I like eating nuts in my entrees. All those Omega 3s. Mm, mm, mm. 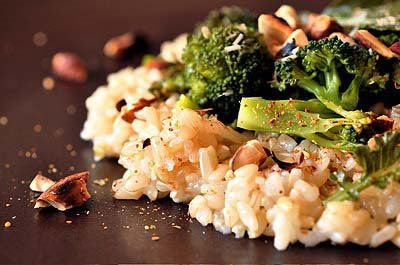 Here's a hippie mix of buttered brown rice, steamed broccoli and cracked toasted almonds. You're gonna say that sounds dull, but it's very vivid. We sprinkled excellent shoyu on it, and I topped my plate with a pinch of bonito flakes. Cranky skipped the bonito in favor of shichimi togarashi. This food rests so comfortably in your stomach. It takes a while to digest, because of the nutrient density of the brown rice and almonds. But your tummy feels really happy. And you're not immediately hungry for a Ho Ho. Not that I'm ever hungry for a Ho Ho. What is a Ho Ho? I'm imagining this, topped with a lovely piece of fine bbq-ed salmon. If you have to ask, you don't deserve a Ho Ho! But I'm surprised you don't remember them (not that they have disappeared). I've forgotten which very upscale restaurant was serving their house-made version with dense chocolate filled with good creamy filling, so there must be fans out there. As for nuts, I find I crave/used them more and more. Tamari-roasted almonds are a fave, and Brazil nuts and hickories. Sorry -- a slip. I wish I HAD some hickory nuts, almost extinct. I meant hazelnuts/filberts. I haven't tasted a hickory nut for many decades. Morgan: That sounds divine. Alas, California's native chinook salmon are in such decline this year, they may ban fishing them. As for Rush Limbaugh: He's the boss of millions of idiots, all Rethuglicans. Kudzu: I looked them up. Ho Hos were invented in 1967, long after I had any interest in grocery store sweets. I never clicked with them. As for nuts, yes! I'm trying to turn Zoomie on to nuts, but her husband might be resistant. I don't think I've ever tasted a hickory nut. But Sam has a Twitter up today about falling in love with the skins of hazelnuts. Do you Tweet? Can I just say that photo is so PRETTY? Mmm, buttered brown rice was a fav when I was a kid, Mom was an unreconstructed hippie, but I haven't had it for a while. This sounds like a wonderfully simple meal for a weekday afternoon. Though I don't think I've ever had bonito flakes. Is there anything more to it I should know before making it? For ages I've been making a take on the brown rice, tofu, veggie casserole from the Greens cookbook, topping it with gomasio, and I need something new (and cheese-less). Once a month I'm making vegetarian and vegan hot dishes for a Buddhist group; is the butter a prominent flavor? Would love to make this the vegan offering next time, with all the Japanese seasonings. And good thinking, Morgan: my s.o. will no doubt keep the leftovers to steam with some Cap'n Mike's. CC: Speaking of nuts and Greens, are you familiar with the nut loaf from that book? I haven't yet made it, but would like to. Hippies like Ho Ho's too. Far out! I do like nuts on their own and in very specific dishes. I'm not a fan of having it on everything. THIS, however, I would eat in a heartbeat. Especially with the salmon morganmouse suggested. Nope, I don't twitter. Facebook is quite enough obsessive connection for me these days....Hickory nuts have a very distinctive flavor, "wilder" than pecans, less rich than black walnuts. They're the devil's own nuisance to crack open (hence the nickname "Old Hickory" to indicate toughness) and are tiny and yield little meat -- but worth the trouble. I am going to check a secret source to see whether there might be some (already shelled, natch) available by mail order. Will get back to you on that. Toss in a scrambled egg, sub out the broccoli for spinach, and add a squirt of sriracha and you have my standard weekday breakfast. Half the time when I read one of your posts I have to open a new window to Google the ingredients. Shcihimiwha? I love meals like this - simple, delicious, and gratifyingly virtuous. I always feel just a bit smug when I eat brown rice with steamed veggies...even if I did wash it down with a six pack. Hey, it's balance, right?? El: Thank you! I'm still learning. I think the success of this one has to do with the dark plate. And pretty food. John: The bonito flakes are strictly optional. I put so few on my plate, they disappeared and I didn't notice them. But it's a cool idea to experiment with. Morgan: The year of your birth?? Limoncello: It's a pretty straightforward preparation; I didn't keep any secrets. You can definitely skip the butter and bonito flakes. It was just a whim. Greg: No they don't! They like Cool Whip and Betty Crocker brownies. Nerissa: Yeah, we don't do nuts every day either. Try this dish; the brown rice we used was local and very fresh. Mm. Nuts are the bomb. Almonds. We have almond butter! Tina: Sorry for the lexicographic detours. Don't worry about washing down your meal with a six-pack. That's how you get six-pack abs.